"Cut The Rope" and "Pudding Monsters": Sneak Peek of NEW 12th Box for "Cut The Rope"
Sneak Peek of NEW 12th Box for "Cut The Rope"
( NEW Update: ZeptoLab just released "Cut The Rope" ver. 1.9 and the 12th box is called "Spooky Box". 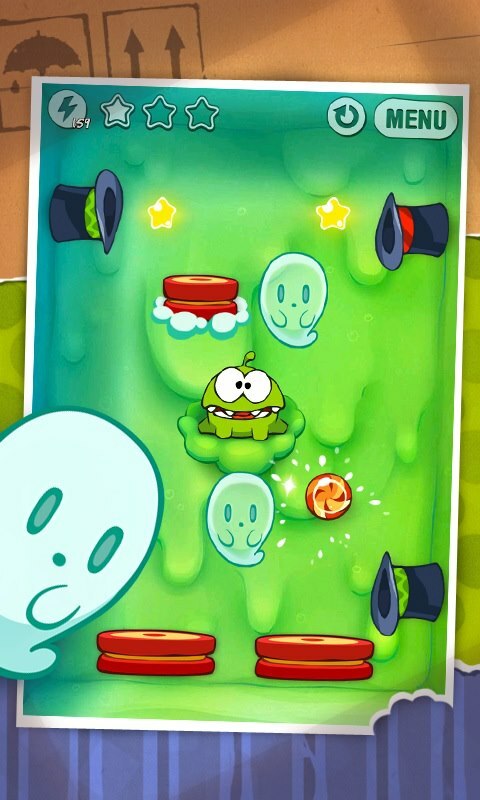 Now "Cut The Rope" has the same "superpower" feature like in "Cut The Rope: Experiments", you can read my previous article: "Cut The Rope: Experiments" ver. 1.4 now has "Superpowers" ! ZeptoLab just released this photo in its Facebook page for "Cut The Rope" (http://www.facebook.com/cuttherope). The name for the new box has just been confirmed to be "Spooky Box" and it has a new game element called the "Ghost" which can morph into (1) bubble, (2) bouncing pad or (3) hidden/automatic rope. Every "Ghost" element is slightly different and in most cases it can only toggle between any 2 of the 3 objects just mentioned (simply tap on it), but in the 14th box "Lantern Box" (released on 7th February 2013), the upper "Ghost" element in Level 14-11 and the one in Level 14-19 can morph into ALL 3 objects. The reason why the "ghost" theme is chosen is probably because we're currently in the middle of the "Ghost Month" which is the 7th lunar month in the traditional Chinese calender. For this year 2012, the "Ghost Month" is from 17th August to 15th September. Hopefully ZeptoLab won't introduce another kind of "powerup" like Rovio (creator of the "Angry Birds" games) which can affect the scores. Recently Rovio introduced the "powerups" previously only available for the Facebook version in the mobile versions (iOS, Android) of "Angry Birds" (Original) and this has annoyed many "Angry Birds" fans who play for high scores in the game because the leaderboards are now all messed up. When using those "powerups", you can get high scores easily so those who worked very hard for the high scores previously are very angry about it. For more details, you can visit the "Angry Birds" fan sites and read all the users' comments there.